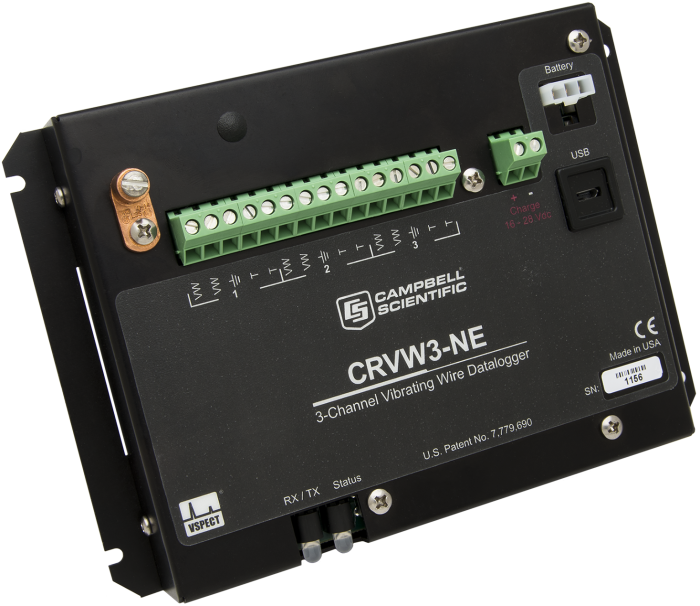 The CRVW3-NE is a three-channel vibrating-wire data logger. It is designed to be an independent data logger, or you can use it as a reliable component in your larger data acquisition system. The CRVW3-NE has multiple communication options and a power regulator for easy solar panel and battery connection. The CRVW3-NE and the CRVW3 are similar products that share the same electronic components. The main difference between them is that the CRVW3-NE allows you to select the enclosure and battery, whereas the CRVW3 includes an environmental enclosure and battery as a complete system. The VSPECT technology is protected under U.S. Patent No. 7,779,690. The CRVW3-NE uses vibrating-wire spectral-analysis technology (VSPECT™) to provide the best measurement possible for vibrating-wire sensors. VSPECT™ observes the incoming sensor signal, performs a Fourier transform and a spectral analysis (transforming the time series into individual sinusoidal components in the frequency spectrum), and determines the sensor frequency by identifying the strongest signal in the acceptable range while filtering out environmental and electrical noise. The CRVW3-NE provides the following data: the resonant sensor frequency, thermistor resistance for temperature calculation, and diagnostic values to help determine the validity of the frequency measurement. Note: The CRVW3-NE requires Device Configuration Utility (DevConfig) v 2.10 or later. When radio options are used, the CRVW3-NE requires LoggerNet v 4.3 or later. All CRVW3-NE dataloggers are tested and guaranteed to meet the following electrical specifications in a -40° to +70°C non-condensing environment. -RF412, and -RF427 options are not CE approved. Charge Terminal 16 to 28 Vdc (from solar panel or dc power converter). Typical applications use 10 to 20 W panels. Battery Terminal Sealed, rechargeable, lead-acid batteries. Typical applications use 7, 12, and 24 Ah rechargeable batteries. -NOTE- Thermistor or RTD resistance can be scaled to Temperature (Deg C) per manufacturer specifications. The resulting temperature can be used as a correction factor for the sensor’s output. Radio Repeater Devices with the -RF451 option can be set up as a radio repeater. Radio Repeater Devices with the -RF407 option can be set up as a radio repeater. Radio Repeater Devices with the -RF412 option can be set up as a radio repeater. EU Conformity View the EU Declaration of Conformity in the Documents section of the web page. -NOTE- To be released for use in Brazil. The CRVW3-NE Vibrating-Wire Datalogger is capable of measuring the most common vibrating-wire sensors including, but not limited to, strain gages, piezometers, pressure transducers, tiltmeters, crackmeters, and load cells. The CRVW3-NE has three sensor inputs; each sensor input includes a vibrating-wire sensor connection and a thermistor connection. The channels are easily configured for traditional sensors. Individual channels can be adjusted to read only the vibrating-wire sensor, or they may be turned off completely. The CRVW3-NE can be ordered with several wireless communication options. The following table illustrates wireless communications compatibilities in terms of networks. Notes: aRetired product; no longer available. bRadio option to be released at a future date. 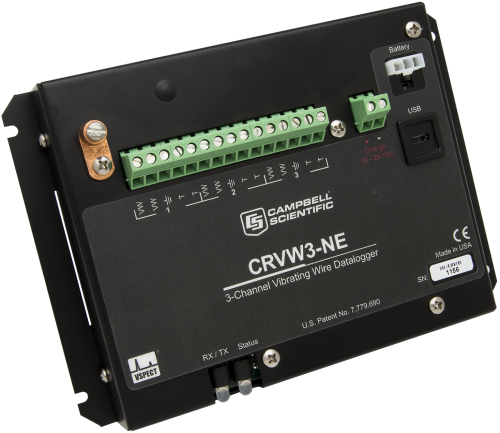 The CRVW3-NE can be installed in various Campbell Scientific enclosures; mounting screws are included with the CRVW3-NE for easy installation. Compatible enclosures include the ENC10/12 and larger. The CRVW3-NE requires an external power source and has a built-in charger/regulator. The charge terminal accepts 16 to 28 Vdc. The battery terminal will charge a 12 Vdc sealed-rechargeable lead acid battery when the charge terminal receives adequate power. Typical applications utilize 10 to 20 W solar panels (SP10 and SP20) to charge 7, 12, and 24 Ah rechargeable batteries (BP7, BP12, and BP24). Current version of the CRVWx firmware. Requires the Device Configuration Utility to upload the firmware to the CRVWx. After the CRVW3 is ordered, can the power options be changed? Yes. The batteries can be switched at any time between the D-cell battery option and the rechargeable battery option. How quickly can a CRVW3 take measurements? The CRVW3 takes approximately 1 s to measure the vibrating-wire sensor and thermistor. If all three channels are measuring sensors, the CRVW3 takes approximately 3 s to measure the sensors before it is ready to begin the cycle again. After the CRVW3 is ordered, can the communication options be changed? The communications options (such as –RF451) reflect how the CRVW3 is built during the manufacturing process. After a CRVW3 is ordered with a specific communications option, it retains that option. It is possible to turn off the wireless communications, and the CRVW3 can be deployed as a stand-alone data logger. What needs to be done before installing a CRVW3? Not much. The CRVW3 needs to be configured, installed, and wired at the site. These steps have been outlined in the Quick Deploy guide that ships with the CRVW3 and is also available for download on this website. The manual is a more detailed resource to address any installation questions.